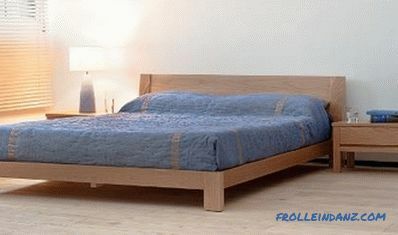 To buy a wooden bed today is not a problem, furniture stores offer a large number of options. However, it is possible to make a bed of wood with their own hands, nothing particularly complicated here. As you know, the eyes are afraid, and the hands do. 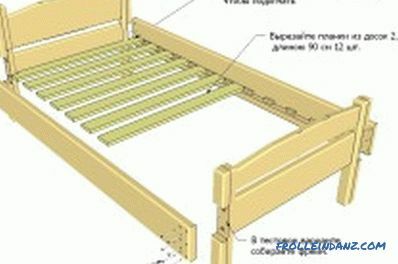 In the manufacture of a bed with your own hands, you can select several advantages: 1 - cost-effectiveness; 2 - uniqueness; 3 - a sense of pride in the work done. Significantly lower cost than buying in a store. It is not a secret for anyone that furniture is offered in stores at a price that not only includes the cost price, but also payment for the brand. Ability to create your own unique version. That exclusivity is today in great fashion. A unique sense of pride. This factor is also important. Isn’t it nice when everyone around you sincerely admires the mastery of the house’s owner? What you need to make a bed? How to make a bed with your own hands? If the bed has non-standard sizes, you can make a mattress to order. 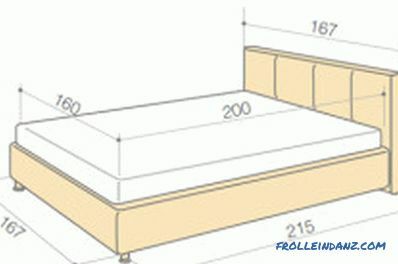 You can first select a mattress and make a wooden bed according to its size. You can first make the frame, after which the mattress is made to order. Regardless of which option is chosen, you need to be aware that each bed includes main parts, such as, back, legs, frame. 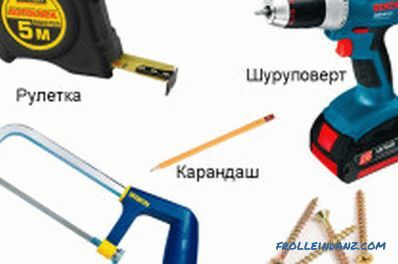 With regard to the selection of material, it is carried out in the light of this list. Now you can start making the bed directly. 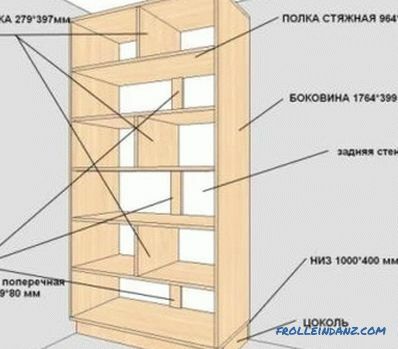 It is necessary to make calculations of materials that will be needed for the manufacture of such furniture. If you plan to make a bed for a specific mattress, then you need to know that the internal dimensions of the frame are about 1 cm larger than the mattress itself. As for the frame, it must be provided with one partition, which is designed to support the mattress (this is necessary if the mattress is provided with its rigid frame). 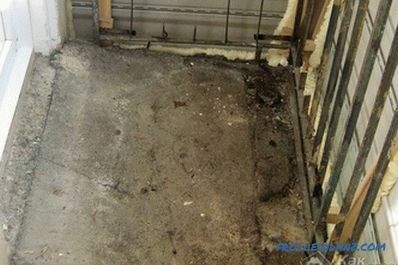 If the mattress does not have a frame, it must have solid flooring. Then you can not be afraid of subsidence of the mattress. When making a bed with your own hands, special attention should be paid to the quality of the material. The tree must be dry, and as for the breed, it all depends on taste preferences and financial possibilities. The frame is made so that the mattress exceeds it by 4-8 cm. After the manufacture of the frame is completed, the rail should be screwed on its inner side (if not, you can use a metal corner). This is necessary in order to provide support for a solid shield or mattress. As for the partitions to support the mattress, they should be made taking into account the width and length of the mattress. In that case, if the partition is performed in width, then one partition, located in the middle of the mattress, will be quite enough. If the partition is performed in length, then you need to consider that they will need at least two. It should be borne in mind that the bar should be on the same level with partitions. Regarding the backs, they can be ordered, and you can make them with your own hands. When self-fabricating backs, it is strongly not recommended to make sharp corners on them, they can easily be rounded off with a grinder. The shape of the legs can be both square and round, they should be fixed on the inner side of the frame. 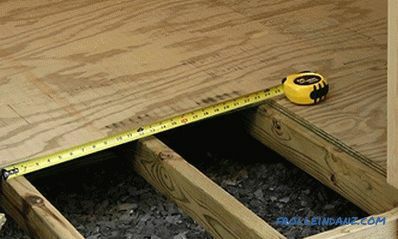 In this case, care should be taken to ensure that the top edge does not protrude above the partitions. Before you start to assemble a wooden bed, all its surfaces must be varnished. Bedside tables can also be made. 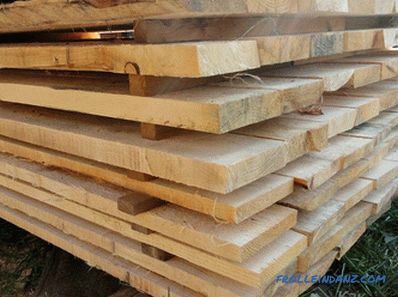 For the manufacture of tabletops, you will need a plank board, and it can also be made independently from planks.The fibers are arranged parallel to the bed. Plates are screwed along the sidewalls, it is to them that the tables are attached. For all the details of the manufactured bed, you must go through the emery paper, at the same time you must begin to sand with large emery paper, and gradually move to a fine-grained one. The surface must be treated in such a way that it becomes completely smooth. If the bed is covered with stain, its color is chosen at the discretion of the owner. 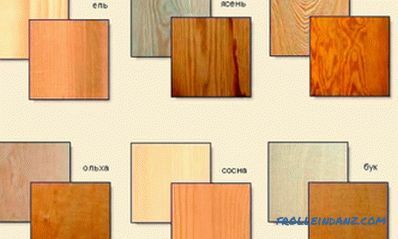 If you like more saturated dark color, then you need to apply several layers of stain. So a wooden bed can be made independently in a short time.